Our savvy Tahiti Travel Experts have some great tips for scoring the best flight deals to Tahiti. In fact, you can save as much as 40% on your international and inter-island flights! Traveling with kids? Families cash in on great flight deals with Air Tahiti Nui’s “Kids Fly Free” program. Children ages 11 and younger fly free in economy between Los Angeles and Papeete. The deal is for one child for every paying adult–only the applicable airlines taxes are charged. Super Score: On occasion, this deal is extended to age 15. Not only that, similar offers are available for round-trip inter-island airfare to any of the following islands – Moorea, Bora Bora, Huahine, Raiatea, Tikehau, and Rangiroa. Be sure to ask your Tahiti Travel Expert about this extra perk! Proving that planning ahead truly does pay, you can save up to $500 on your international flight (LA to Tahiti) when you book more than 120 days in advance. 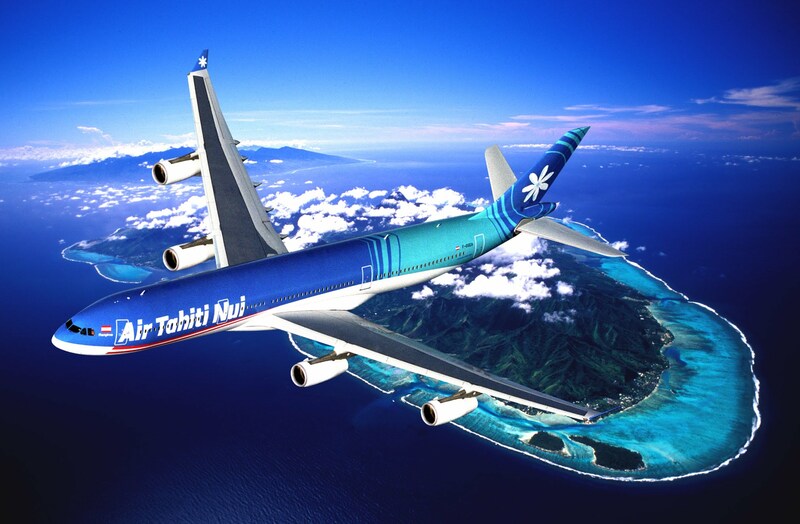 Air Tahiti Nui offers this low season fare for travel during November 1st through December 10th, and January 11th through March 31st. The discount is available only when paired with an inter-island round-trip ticket which works perfectly because you’ll need it for visiting islands such as Bora Bora, Raiatea, or many of the other outer islands. The Brando Resort on Tetiaroa offers one of the most unique and luxurious all-inclusive resort experiences in the South Pacific. A stay at the Brando is not inexpensive (by anyone’s definition) but you can stretch your budget with free flights from Tahiti to Tetiaroa. Book at least a three night, all-inclusive stay for travel through September 30th, and you’ll save over $1,000 per couple on air. Most travelers are familiar with Bora Bora—definitely not to be missed for it’s beautiful lagoons, lavish resorts, and iconic overwater bungalows. So, here’s an opportunity to take your vacation from amazing to epic by experiencing Bora Bora with Rangiroa or Tikehau in the Tuamotu Islands. These two lesser-known islands feature some of the world’s most spectacular lagoons, diving, snorkeling, fishing, and private island experiences. Add a stay at the Tikehau Pearl Beach Resort or Kia Ora Rangiroa Resort, and you’ll fly there for free from Bora Bora—a savings of several hundred dollars. This deal is good for travel between October 1st, 2016 and March 31st, 2017 (not available during blackout dates of December 20th through January 3rd). Contact our Tahiti Travel Experts to help you save on your next vacation to Tahiti!